Tarique Fosu-Henry scored twice as Colchester United beat Yeovil 2-0 - but it was not enough to fire them into the League Two play-offs. Otis Khan curled a first-time shot wide for Yeovil early on but Matt Briggs headed a good chance wide for Colchester and then went close with a long-range effort that flashed inches past a post. Colchester eventually made the breakthrough in the 36th minute through Fosu, who collected possession midway inside Yeovil half and drilled a fine low 25-yard shot into the bottom corner. Briggs dragged a low shot past the far post soon after and Wright squandered a gilt-edged chance early in the second half when he blasted over, with only keeper John Maddison to beat. Brindley's 30-yard free-kick dipped just over before Colchester doubled their lead with 13 minutes remaining through Fosu, who coolly slotted home after Tom Eastman had capitalised on a Yeovil mix-up to pick him out. 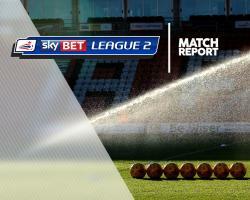 But Carlisle's 3-2 win at Exeter prevented Colchester from claiming a coveted play-off spot.